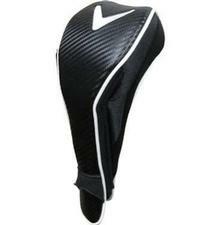 Keep your driver protected on and off the course with the Callaway Dual Mag Hybrid Headcover. Designed to fit 460cc hybrid models, this driver headcover is made of high-quality synthetic leather and features an innovative dual-magnet design that provides easy on and off. If you have any more questions about the Callaway Golf Dual Mag (Black/White) Hybrid Headcover ; do not see the model you are looking for; need custom options; or prefer to not purchase online, then please call us at (630) 656-1291.